Beijing's bicycling culture is on its way to extinction. 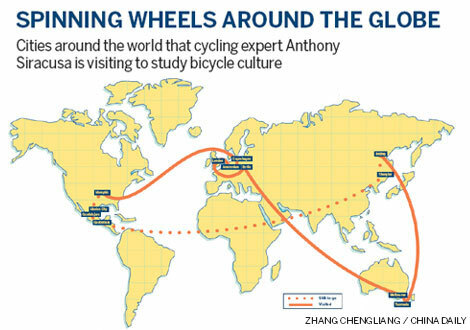 This is the stark appraisal of cycling expert Anthony Siracusa, who has spent the last eight months studying different bicycling cultures around the world. "It's not extinct here, but I would say the bicycle culture is an endangered species in the Chinese urban environment," Siracusa told METRO. The 25-year-old American is one of 40 people to have been given a one-year fellowship in 2009 by the Thomas J Watson Foundation, a US organization started by the son and daughter of Thomas J. Watson who founded computer giant IBM. The fellowship provided 196,000 yuan ($28,000) to help him pursue his one-year documentation of bicycle cultures on four continents. He has so far spent $23,000. He has already visited Copenhagen - a place he describes as one of the most advanced in terms of bike culture - Amsterdam, Melbourne, London and Berlin. "These are all places in various areas of development in their Bicycle culture," Siracusa said. Beijing was once known as the "Bicycle kingdom" of the world, but after he arrived in Beijing on March 1, Siracusa realized the situation was grim. "As my taxi drove farther and farther into the city I kept on saying to myself, certainly there will be more bikes once we are in the city center, but they just weren't there,"he said. He said seeing Beijing's declining bicycle culture was difficult to take. "I've come here to see this declining bicycle culture, but to see it first hand and to know it in your mind intellectually are two different things." Though Beijing may not have as high a percentage of cyclists as other developing biking communities, this city does have its strengths, he said. Beijing's bike infrastructure is quite easily one of the best compared to almost all of the cities he's been to. The number of bike lanes, bike racks outside of businesses, and bicycle traffic lights are comparable to Copenhagen, Siracusa says. Not surprisingly he attributes Beijing's declining cycling culture to the city's rapid adoption of the car as its favorite means of transport. "Just riding here today, there were cars lined up almost as long as street, all stuck in traffic, meanwhile the bike lanes were almost empty," he said. "It's interesting to see how the development of car culture can limit and inhibit, or in this case, stunt, the growth of bike culture," he said. Most his research, he said, takes place simply by hopping on a bike and cruising around the city, even if that means braving the cold. In Beijing he has spent more than three hours a day for the last eight days cruising the city on his current bike, a Giant XC770 lent to him by the Natooke bike shop in Beijing, observing traffic flows, infrastructure and other bikers. Siracusa said everywhere he goes he able to quickly tap into the local biking community and either build his own bike from spare parts - he has built five on his journey so far - or find someone willing to lend him a bike. "I will usually just walk into a shop and start chatting with the owners. Once they see that I'm keen, they will usually be more than happy to help out," he said. In addition to first hand observation and examining policy documentation, Siracusa said he also talked with bike enthusiasts in each area to understand the local culture. "I hope to inspire them with my dedication to learning about the way that bicycles can transform lives and transform cities in positive ways, because that's really what I'm about," he said. After Beijing, Siracusa's next stop is Guatamala where he intends to work with a small Guatamalan company helping produce bicycle-powered farming machines.